This entry was posted in Classical Music, Live Performance Reviews, Vinyl and tagged Albinoni Adagio, Beyer, Mozart, Requiem, Sussmayr. Bookmark the permalink. 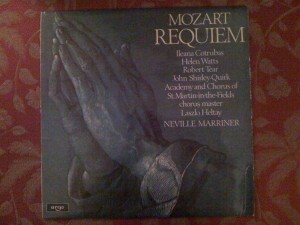 I really enjoyed your blog about Mozart’s Requiem. It is truly one of his greatest works. When I went there I read your article about Daniel. Sounds like an interesting guy. I haven’t listened to his music yet, but I will shortly. I have always been a fan of the Avant Garde. Have you heard William Duckworth or Kyle Gahn or Glenn Branca? Branca is phenomenal but not for everyone. But I wanted to get back to Mozart. There is another version that I like even better than Beyer. That is the newest one from Robert Levin. When I was in the Lubbock Chorale a number of years ago we sang the Levin version and it is incredible. Here are a few quotes from the liner notes of the CD I own. Martin Pearlman: “It is not often that one can present an important and thorough re-thinking of a well-known masterpiece. “… it, (Sussmayr), has long been criticized for being weak and un-Mozartean in many passages and for containing erros in musical grammar. The repairs made by Robert Levin in this new version range from many small details to significant changes in the orchestration, as well as bold left turns in the harmony that will surprise those who know the work well. “Inevitably, people will disagree about the details of any completion, whether by Sussmayr or by a modern editor. 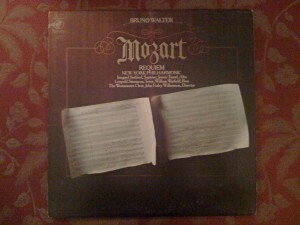 The notes that Mozart himself wrote have taken on a canonical status; they seem fixed and inevitable. This is, of course, partly because his genius is in them, but it is also because we do not question Mozart in the same way that we question a collaborator, no matter how good that collaborator may be. ” A case in point is the new Amen fugue in the present completion. It is based on a rather severe contrapuntal sketch Mozart made for the opening bars. Did Sussmayr mistakenly overllok the sketch or did Mozart himself decide to discard it? But if we do decide to include it in a new version, the best course for a modern collaborator is to work out the material of the sketch into a completed fugue, as in the present completion. Mozart himself may have done exactly that – or he may eveentually have mixed this material with a more modern, homophonic music, as he sometimes did elsewhere. John, the Amen fugue is absolutely beautiful and incredible. Sussmayr did not include a realization of this fugue in his version, but rather, ended the Lacrimosa with a two chord Amen. Give Levin’s version a listen to, it is really awesome! Here is some YouTube videos of Robert Levin talking about Mozart. If you want to see an example of the genius that was Mozart this is a glimpse you must witness. Here is a short biography of Robert Levin that I hope you find interesting. This is absolutly facinating stuff. I really appreciate you sharing this. The manage subscriptions always shows up when you click on the comment or reply button. No matter what page you are on it works that way. FYI. Thanks for the great comment and very interesting additional information about the Mozart Requiem.